The RAM 375/500 Range of Triplex Reciprocating Plunger Pumps, are designed and manufactured to the highest degree of precision to ensure total reliability and efficiency. Tailoring of the core design is easily performed with effective enhancements to metallurgy and elastomers in order to exceed the requirements of the process conditions. As with all units within our range Ram Pumps are purposely designed and developed to maintain conformity to the latest quality standards and directives essential for supplying our tailored solutions to the most arduous and demanding applications. is 450 kW – Please ensure specific application data is calculated to determine maximum absorbed power required. Crankcase design with special built-in motor support mounting. 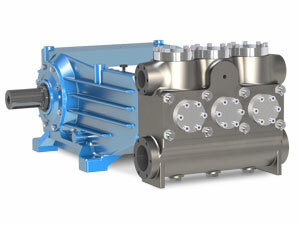 Providing the option of installing the motor overhead to keep both the footprint and weight to a minimum. A range of liquid end materials are available including 316 stainless steel, 22% Duplex, 25% Super Duplex and Inconnel 625. Providing complete compatibility with pumping media. Special pressure-formed, braided, PTFE impregnated Kevlar® packings. Offering exceptionally long life and a wide range of liquid compatibility. Packings housed in packing cylinder. Assuring proper alignment and optimum life. Plungers are specially surface treated for abrasion resistance. Solid ceramic plungers are also available. Providing the highest quality sealing surface for extended packing life. Spheroidal graphite iron crankcase. Offering exceptional strength, vibration dampening and flame and spark resistance for added protection in hazardous areas. Various plunger diameters available. Allowing for a wide range of performances to best suit the application. Standard splash crankcase lubrication with optional pressure lubrication system. Customised builds available to suit individual clients specification.